Historically, the impact testing was developed in the 19th century to address brittle failures which caused catastrophic accidents in the railway industry. Over time, the test was refined with the development of equipment that could measure absorbed energy as well as standardization of the specimen size and notch geometry. While the written standard was tentatively introduced in the 1930's, it was not commonly adopted in material specifications until after 1948 when a report was released establishing the correlation between the impact properties of fractured plates and the likelihood of brittle fracture due to the many failures that occurred to the Liberty cargo ships used in WWII. The results provided by the charpy impact test were often scattered, and somewhat unreliable, until it was determined that machine maintenance and regular testing could dramatically tighten the margin of error of the results. Thus, the indirect verification method was instituted. High quality specimen preparation directly affects data integrity. 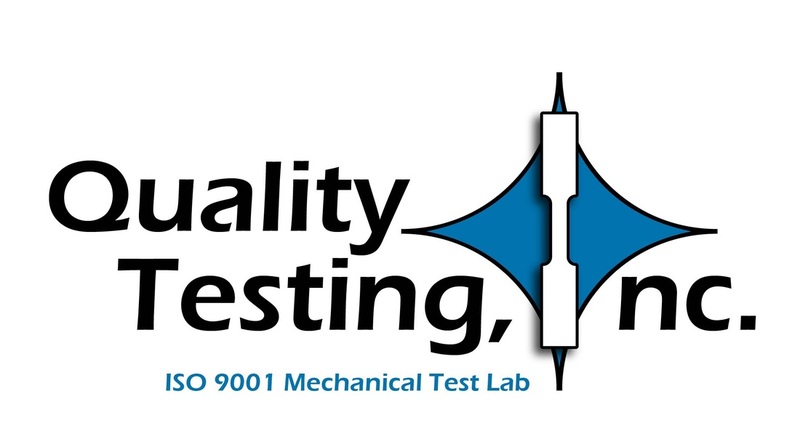 Quality Testing, Inc. is capable of producing charpy specimens as small as 3 mm thick with our using our in-house machine shop equipped with state-of-the-art CNC machines. We hold tolerances within +/- 0.001", and inspect the accuracy of our notch geometry using an optical comparator. We can test charpy v-notch specimens at temperatures between -320ºF to 200ºF and generating up to 300 ft. lbs. of energy. Once the v-notch impact specimens are broken we can measure shear percentage and lateral expansion. Often shear percentage is measured using the "eyeball" method. We have developed a way to quickly and accurately evaluate shear using a calibrated video measurement system, taking the guess work out of the equation. Let us quote your job for charpy impact testing services to determine if your material is ductile at your required service temperature. A Charpy V-notch impact test, also known as toughness testing, is a dynamic test in which a notched specimen is struck and broken by a single blow of a freely swinging pendulum of a Charpy impact machine. Since the pendulum is released from a fixed height and the mass of the pendulum are known, the energy of the strike is predetermined. The other principal feature of the Charpy impact machine is a fixture designed to support an impact test specimen is a simple beam at a precise location. The fixture is arranged so that the notched face of the specimen is vertical. The pendulum strikes the other vertical face directly opposite to the notch. The measured impact test values may be the energy absorbed, percent shear fracture, and/or lateral expansion opposite the notch. Our impact test machine is capable of generating up to 300 ft. lbs. of energy and is used to determine the ductility at temperature. the specimen is broken within 5 seconds after removal from the medium.